For the pitcher of the same name, see José Bautista (pitcher). This name uses Spanish naming customs: the first or paternal family name is Bautista and the second or maternal family name is Santos. José Antonio Bautista Santos (born October 19, 1980) is a Dominican professional baseball right fielder who is a free agent. He has played in Major League Baseball (MLB) for the Baltimore Orioles, Tampa Bay Devil Rays, Kansas City Royals, Pittsburgh Pirates and Toronto Blue Jays. His professional career began when the Pittsburgh Pirates selected him in the 20th round of the 2000 first year player draft. In 2010, Bautista became the 26th member of the 50 home run club while leading the major leagues in home runs for the first of two consecutive seasons, and, from 2010–15, has hit more home runs than any player in the major leagues. An MLB All-Star selection six consecutive times, he has won three Silver Slugger Awards and two Hank Aaron Awards. In addition, he has received the American League Player of the Month Award five times and the Player of the Week four times. Before being traded to the Blue Jays, Bautista primarily played third base. 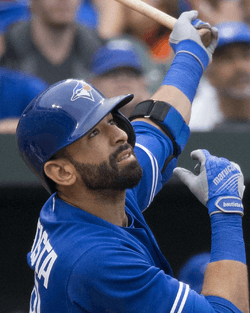 Although major league scouts initially noted Bautista while in junior college for his batting skills – including power hitting potential – and a strong throwing arm, his career took detours until realizing his potential in 2010. He made his MLB debut with the Baltimore Orioles in 2004, and, that year, became the first player ever to appear on five MLB rosters in one season. The last of those clubs were the Pirates, where he played at five different positions as a utility player until being traded to the Blue Jays in 2008. After making adjustments to his swing, Bautista broke through with ten home runs in September 2009. He has since been voted in the top ten in the AL Most Valuable Player Award four times and is a leader or among the top ten in numerous offensive single-season and career categories in Blue Jays' franchise history. Since 2010, Bautista has hit at least 20 home runs each year, and in four of those seasons, has hit at least 35 home runs, has both scored and driven in at least 100 runs, and has drawn at least 100 bases on balls, including twice leading the AL. In 2015, while playing in the playoffs for the first time, his bat flip in the American League Division Series caused a sensation that became a symbol of Toronto's first playoff appearance in 22 years. In 2011, he set up a program that assists athletes from the Dominican Republic to attend universities in the United States. Coming from a middle-class family in the Dominican Republic that stressed education, Bautista began his study of English at age eight. His mother was an accountant and financial planner, and his father, who had earned a master's degree in agricultural engineering from Hungary, ran poultry farms. Bautista attended a private high school, De La Salle High School, in Santo Domingo. He was aided by the Latin Athletes Education Fund, designed for players from Spanish-speaking countries aspiring to play college baseball in the United States. Although he invested much time in pursuing professional baseball, Bautista studied business at Mother and Teacher Pontifical Catholic University in case a career in baseball did not materialize. After working out with various Major League Baseball (MLB) clubs, he turned down offers of $5,000 from the New York Yankees and $42,000 from the Arizona Diamondbacks. The Cincinnati Reds offered him $300,000, which Bautista accepted. However, before the contract could become official, the team changed ownership and subsequently rescinded the offer. Bautista then created a highlight tape of himself using a camcorder and sent it to various colleges in the United States. There was no response until he received a call from Oscar Pérez, who he had known from the Quique Cruz League, a league in the Dominican Republic. Pérez informed him of the Latin Athletes Education Fund, designed for players from Spanish-speaking countries aspiring to play college baseball in the United States. He connected Bautista with Don Odermann, a businessman in the San Francisco Bay Area. Odermann, who assisted baseball players from Latin America desiring to play baseball in the US, knew that Chipola College, a junior college in Marianna, Florida, was seeking an everyday player. There, Bautista played for two years until being drafted. The Pittsburgh Pirates drafted José Bautista in the 20th round of the 2000 Major League Baseball draft from Chipola College. After playing in Minor League Baseball in the Pirates organization through 2003, the Baltimore Orioles selected him in the Rule 5 draft and carried him on their Opening Day roster. He made his MLB debut with Baltimore on April 4, 2004. The Tampa Bay Devil Rays claimed him off waivers on June 3. Twenty-five days later, the Kansas City Royals purchased him from Tampa Bay. The Royals then traded him to the New York Mets on July 30 for Justin Huber, who then traded him minutes later to Pittsburgh with Ty Wigginton and minor leaguer Matt Peterson for Kris Benson and Jeff Keppinger. This series of transactions made him the first and only player to appear on five different Major League rosters in one season. Bautista played in 11 games for the Pirates in 2005. In 2006, his first full season in the major leagues, Bautista hit .235 with 16 home runs (HR) and 51 runs batted in (RBI). The following season in 2007, he posted similar numbers in 142 games, finishing the season with a batting average of .254, 15 home runs and 63 RBI. That same year, he became the starting third baseman for the Pittsburgh Pirates. He took over for reigning National League batting champion Freddy Sanchez, who moved to second base. Bautista was to be the Pirates' starting third baseman and backup outfielder in 2008. From June 14 to 24, he hit five home runs in a span of nine games against interleague opponents Baltimore, Chicago White Sox, Toronto Blue Jays, and the New York Yankees. However, he struggled offensively for most of the year, and after the 2008 trade deadline Bautista lost his starting job to the newly acquired Andy LaRoche. Bautista was optioned to the Triple-A Indianapolis Indians on August 13. After performing well there, on August 21, the Pirates traded him to the Blue Jays for a player to be named later, who eventually was Robinzon Díaz. Starting the 2009 season on the bench, manager Cito Gaston assigned Bautista to back up third baseman Scott Rolen and outfielders Alex Ríos and Adam Lind. Bautista started the season with a .317 batting average, .404 on-base percentage (OBP) and .463 slugging percentage (SLG) in 49 plate appearances in April. However, his numbers fell off, as he batted between .167 and .231 each month from May through August with two total home runs. At times he showed marked plate discipline; in the month of May, he walked 14 times for a .403 OBP despite batting just .231. Eventually, the Chicago White Sox claimed Rios off waivers, the Blue Jays assigned Lind to the role of designated hitter, and an injury to Marco Scutaro led to an increase in Bautista's playing time and making him the leadoff hitter. As the season drew to a close, the Blue Jays made changes to their coaching staff. One was to move first base coach Dwayne Murphy to replace the retiring Gene Tenace as hitting coach. Formerly a Blue Jays' minor league roving hitting instructor and hitting coach, Murphy had already spent nearly one year working with Bautista, teaching him to leverage his pull power by starting his swing with his now-familiar high leg kick. In September, he finally broke through, hitting 10 home runs with 21 RBI, a .257 batting average and a .606 slugging percentage (SLG). He hit 13 total HR in 2009 with 40 RBI, a batting average of .235, and 79 hits in 113 games. Originally considered to be a non-tender candidate, he re-signed with the Blue Jays on a one-year $2.4 million US contract for the 2010 season. Bautista began the 2010 campaign as the starting right fielder and leadoff hitter. On May 17, he was named AL Player of the Week after hitting .444 (8-for-18) with 20 total bases, four home runs, eight RBI, eight runs scored, a .565 OBP, and an MLB-best 1.111 SLG. Bautista hit his 20th home run as part of a two-home run night against the St. Louis Cardinals on June 22, setting a new career high for a single season in just two months. Bautista was selected as a reserve for the 2010 Major League Baseball All-Star Game. Bautista entered the game as a pinch runner for Josh Hamilton and finished the game 0–for-1. For the month of July, Bautista batted .347, with 11 home runs, 29 RBI, and an AL-leading .765 slugging percentage, sharing American League Player of the Month honors with Twins outfielder Delmon Young. Bautista was also named Blue Jays' Player of the Month, which is selected through voting by the Toronto chapter of the Baseball Writers' Association of America. With his 12 home runs in May and 11 in July, Bautista became only the third Blue Jay player in franchise history to have two months with at least 10 home runs. Bautista was named co-winner of the American League Player of the Week award for the period ending August 1. Bautista hit .545 with five homers and 13 RBI during that span. On August 26, Bautista hit his 100th career home run against the Detroit Tigers. Bautista was again named player of the week for the week ending August 29; in seven games that week, Bautista led the American League with a .500 batting average (10-for-20) and hit four home runs. Bautista became the only Blue Jays player to ever win the award three times in one season. Bautista won AL Player of the Month for the month of August, in which he hit he led the AL in home runs (12), RBI (24), slugging percentage (.724) and total bases (72), while tying for the lead in extra-base hits (18). He finished tied for second with 23 runs and was third with 23 walks. He also won the Honda Player of the Month Award, his second such award in as many months. On September 17, Bautista set the new Blue Jays single-season home run record with his 48th home run, breaking the record set by George Bell. On September 23, Bautista became the 26th player in Major League Baseball history to reach the 50 home run club in one season, and the first Toronto Blue Jay player to do so. His 52nd home run set a new MLB record for the largest single-season increase in home runs, eclipsing Davey Johnson's 38 home run increase from 1972 to 1973. Bautista finished the 2010 season with an MLB-leading 54 home runs, the highest total since Alex Rodriguez hit 54 in 2007. Bautista won the AL Hank Aaron and a Silver Slugger Awards for his offensive performance. and finished fourth in the AL Most Valuable Player Award (MVP) voting, behind Hamilton, Miguel Cabrera and Robinson Canó. The Toronto chapter of the BBWAA named Bautista the Blue Jays' Most Valuable Player, the Blue Jays' Most Improved Player, and presented him the John Cerutti Award for displaying "goodwill, cooperation and character". Bautista at bat in 2011. Bautista agreed to a five-year contract extension worth US$64 million before the 2011 season. He began the season as the starting right fielder for the Blue Jays, with Edwin Encarnación playing third base. Bautista walked 28 times in the month of April, breaking a club record that was set when Carlos Delgado collected 26 bases on balls in April 2001. Bautista was unanimously selected for the Blue Jays' Player of the Month award, and was also named the AL Player of the Month for the month of April (his third such award in four months, dating back to the 2010 season). On May 15, Bautista hit three home runs against the Minnesota Twins, the first three-home run game of his career. On May 28, in a home game against the Chicago White Sox, Bautista hit his 20th home run, a three-run shot to left field, becoming the first player to reach 20 home runs in 2011 as well as the fastest player to reach 20 home runs (44 games) in Blue Jays franchise history. Bautista won the AL Player of the Month award for May, his fourth such award in five months. He also became the first player to have the highest number of home runs in a single month for five consecutive months since Jimmie Foxx did so from June 1933 to April 1934. Bautista also won the Blue Jays' Player of the Month award for the second consecutive month. On June 23, the Blue Jays shifted Bautista to third base and recalled Eric Thames to play the outfield. Bautista was selected for the 2011 MLB All-Star Game, receiving a record 7,454,753 votes. At the time of his selection, he led the MLB in home runs (26), walks (70), OBP (.471), slugging percentage (.679), OPS (1.150), times on base (160) and was also in second place for runs scored (64), total bases (182) and extra base hits (41). He became the first Blue Jay in history to lead the league in All-Star voting. He was also the first Blue Jay to be voted into the All-Star game as a starter since Carlos Delgado in 2003. Bautista participated in the Home Run Derby; he hit four home runs and was eliminated in the first round. On August 5, with the debut of prospect Brett Lawrie to play third base, Bautista returned to right field. In a game against the Oakland Athletics on August 20, Bautista walked three times, which brought his season total to 102 walks in 113 games, the fastest a player reached 100 walks since Barry Bonds in 2007. During a game against the New York Yankees on September 5, Bautista hit his 40th home run of the season, a solo homer off reliever Rafael Soriano. He became the second player in franchise history with back-to-back 40 home run seasons. Two games later on September 7, against the Boston Red Sox, Bautista stole home plate on a double steal in which Lawrie took second base, becoming the first 40 home run hitter to steal home plate since Adam Dunn in 2004. After leading the major leagues in home runs for the second consecutive season with 43, Bautista became the first player to do so since Mark McGwire in 1998 and 1999. Baustista also led the majors in slugging percentage (.608), OPS (1.056) and walks (132) and the AL in intentional walks (24). He placed second in OBP (.447) behind Cabrera. He batted .302 and also placed in the top ten in the league in runs scored (105), total bases (312) and times on base (293). Defensively, he led AL right fielders with five double plays turned and placed fourth in assists with 13 and fifth with six errors. His walk total was the highest in the league since Jason Giambi collected 137 in 2000, while setting a new Blue Jays franchise record, which Delgado previously held with 123, also in 2000. He also set new Blue Jays' single-season records with 8.1 total Wins Above Replacement (WAR) and 8.3 offensive WAR according to Baseball-Reference.com, edging John Olerud's 7.7 total in 1993, and Delgado's 8.1 offensive WAR in 2000. Bautista held the record for total WAR until Josh Donaldson rated at 8.8 in 2015; however, as of 2015, Bautista still holds the record for offensive WAR. He was the American League winner of the Hank Aaron Award for the second consecutive season, becoming just the third player in the award's history, after Rodriguez and Barry Bonds, to win the award in back-to-back years. Bautista also received his second consecutive Silver Slugger Award. On January 30, Bautista was announced as the cover athlete for the Canadian edition of MLB 12: The Show. In an interleague game against the Milwaukee Brewers on June 19, 2012, Bautista hit the second of three straight solo home runs by the Blue Jays, between Colby Rasmus and Edwin Encarnación, the first time since 2005 that the Jays went back-to-back-to-back with home runs. Bautista also took over the MLB lead in home runs for 2012, hitting his 25th on June 27 against the Boston Red Sox, which broke the Blue Jays club record for home runs in a month, with 13. He went on to finish the month with 14 home runs, one short of the American League record for June. Bautista was voted an American League starter in the All-Star Game for the second consecutive year and his third overall All-Star selection. Hamilton surpassed Bautista's record vote total of the prior year. On July 2, Bautista was named American League Player of the Month for June. It was his fifth time receiving the honor in his career. He batted .274 with 14 home runs and 30 RBI in the month of June. His 14 home runs in June set a new Blue Jays franchise record for home runs in a month. Bautista competed in the Home Run Derby. At the time of his selection, he led all major league players with 26 home runs. Bautista finished second to Prince Fielder. Bautista was placed on the 15-day disabled list on July 17 with inflammation in his wrist. He had started in all previous 90 games, and the Blue Jays called up prospect Anthony Gose to take his place after the game. Bautista was activated on August 24, but returned to the disabled list on August 26 after he re-aggravated the injury to his left wrist. On August 28, the Jays announced that he would undergo season-ending surgery on the wrist. In 2012, Bautista batted .241 with 27 home runs and 65 RBI in 92 games. On January 21, 2013, it was announced that Bautista would once again be the cover athlete of the Canadian edition of MLB 13: The Show. Bautista hit his 200th career home run in a game against the Boston Red Sox on June 29. On July 6, he was elected to his fourth consecutive All-Star Game, and his third as the starting right fielder for the American League. At the time of his selection, he batted .264 with 20 HR and 52 RBI. In the All-Star Game, he recorded the game-winning RBI on a sacrifice fly in the fourth inning as the American League won 3–0. Playing against the Oakland Athletics on July 30, Bautista hit his 25th home run of the season. In doing so, he became the fourth player in Blue Jays franchise history to hit at least 25 home runs in four consecutive seasons, joining Bell (1984–1987), Carter (1991–1996), and Delgado (1996–2004). His season ended prematurely for the second consecutive time on September 4, when it was announced that he would be shutdown with a left hip bone bruise. Bautista finished 2013 with a .259 batting average, 28 home runs, and 73 RBI. Bautista opened the 2014 season with a streak of 37 games in which he reached base safely. His streak, the longest to open a season in Blue Jays franchise history, came to an end on May 11, when he went 0–4. On June 18, he recorded his 1,000 career hit in a game against the New York Yankees. Bautista was named as the American League Captain for the 2014 Major League Baseball Home Run Derby on June 23. On July 6, it was announced that not only was he elected to his fifth consecutive All-Star Game, but, for the second time, received the highest number of votes in the Majors, with 5,859,019. On August 10, Bautista ended the longest game in franchise history by hitting an opposite field single to drive in Munenori Kawasaki in the 19th inning, and give the Jays the 6–5 win over the Detroit Tigers. On August 26, Bautista hit his 25th home run of the season, and in doing so, joined Carter and Delgado as the only Blue Jays players in franchise history to hit at least 25 in five or more consecutive seasons. Four days later, Bautista hit his 100th career home run at Rogers Centre, a two-run shot off Yankees starter Michael Pineda, and his fourth straight game with a home run which tied a career-high. He would go on to hit a home run on August 31, extending his home run streak to five games and establishing a new career-high. In a home game against the Chicago Cubs on September 8, Bautista hit his 200th home run as a Blue Jay, joining Bell, Delgado, Carter, and Vernon Wells as the only players with 200 or more home runs in franchise history. Bautista finished 2014 with a .286 batting average, 35 home runs, and 103 RBI. He won his third Silver Slugger Award for his efforts. In early 2015, Bautista earned 10-and-5 rights by having at least 10 years of service time in the big-leagues, with the last 5 being on the same team. These rights give Bautista the ability to veto any trade he would be involved in. In a home game against the Orioles on April 21, Bautista hit his 250th career home run. He injured his right shoulder during that game, attempting to throw out Delmon Young at first base. He was held out of the lineup for several days before returning, exclusively as the designated hitter. Bautista received a cortisone shot on May 24 and returned to the outfield on June 2, against the Washington Nationals. On July 6, Bautista was named to his sixth-consecutive All-Star team, as a reserve outfielder in Cincinnati. However, on July 11 it was announced that he would sit out the game due to a shoulder injury. Bautista tied Vernon Wells for second place on the Blue Jays' all-time home run list on July 21, when he hit his 223rd home run for Toronto in a 7–1 win over the Athletics. He surpassed Wells on July 24 in a 5–2 loss to the Seattle Mariners. On September 30, Bautista surpassed the 40 home run mark for the third time in his career, hitting a solo shot in the ninth inning against the Baltimore Orioles to extend the Blue Jays lead to 11–1. The Blue Jays would win the game, 15–2, and clinch the American League East. Bautista finished the 2015 regular season with a .250 batting average, 40 home runs, and 114 RBI. He also walked more than he struck out for the second consecutive year, totaling 110 walks to 106 strikeouts. From 2010–15, he batted .268 with 153 doubles, 227 home runs, 582 RBI, 574 BB, 576 SO, .390 OBP, .555 SLG, .945 OPS, and 156 OPS+. In that span, he hit home runs than any other major leaguer – 28 ahead of second-place Miguel Cabrera – was second in slugging percentage and walks, third in OPS and OPS+ and fifth in OBP. José Bautista's bat flip after hitting a home run in the bottom of the seventh inning of game 5 of the 2015 American League Division Series. On October 8, 2015, with just over 1,400 career games played, Bautista made his postseason debut against the Texas Rangers in the American League Division Series (ALDS). In the fifth and final game of the series on October 14, Bautista hit a three-run home run off Sam Dyson that gave the Jays a 6–3 lead that they would not relinquish, sending Toronto to the American League Championship Series (ALCS). Bautista watched the home run and flipped his bat high into the air before running the bases, a celebratory gesture that was applauded by Jays fans and media outlets, while drawing the ire of Rangers players as unsportsmanlike, in the midst of a 53-minute seventh inning laden with controversy. A vital symbol of Toronto's first postseason appearance since 1993, the bat flip was voted Esurance's MLB Award for Best Play on Offense for 2015. In the five games of the ALDS, Bautista batted .273 with two home runs and five RBI. In Game 3 of the ALCS against the Kansas City Royals, Bautista had one hit and two walks, joining Keith Hernandez as the only players in MLB postseason history to reach base three times on their birthday. The Blue Jays would win the game, 11–8. In Game 6, Bautista hit two home runs, including a two-run game-tying homer at the top of the eighth inning to tie the game at 3–3; however Kansas City would win 4–3 to take the pennant. On November 3, 2015, Toronto exercised Bautista's $14 million option for 2016. During his final regular season plate appearance against the Texas Rangers on May 15, 2016, Bautista was hit by a pitch from Matt Bush, which many believed to be retaliation by the Rangers organization for Bautista's bat flip in the 2015 ALDS. Two batters later, Bautista, intending to break-up a double play, made an illegal slide into second base and made contact with Rougned Odor. Odor retaliated by shoving Bautista and punching him in the face, which ignited a bench-clearing brawl. Bautista was handed a one-game suspension by the league for his part in the melee, which he appealed. On May 27, MLB announced that they had upheld the suspension. During the day of his suspension, Bautista served as the public address announcer at Rogers Centre. On June 17, 2016, he was placed on the 15-day disabled list due to an injury to his left big toe. He returned from the disabled list near the end of July. On August 2, Bautista hit his 300th career home run, a solo shot off Houston Astros starter Lance McCullers Jr..
On November 7, the Blue Jays extended a $17.2 million qualifying offer to Bautista, which he declined on November 14. Bautista's nickname is "Joey Bats". Bautista and his girlfriend Neisha Croyle had their first daughter together, Estela, born April 2011. His second daughter, Ava, was born in November 2012. In 2011 Bautista set up a program to aid athletes to have the same opportunity he had to attend American universities. Initially focused on the Dominican Republic, it has expanded to Canada. 1 2 3 4 5 6 "Jose Bautista statistics & history". Baseball-Reference.com. Retrieved September 21, 2014. ↑ "José Bautista – Toronto Blue Jays – Career Statistics – MLB". Sports.yahoo.com. Retrieved September 28, 2011. ↑ Blue Jays Press Release (August 21, 2008). "Blue Jays acquire Bautista". MLB.com. Retrieved January 24, 2013. 1 2 3 4 5 "Blue Jays top ten batting leaders". Baseball-Reference.com. Retrieved January 6, 2016. ↑ Schwarz, Alan (May 5, 2008). "Education fund for latin players quietly changes lives". nytimes.com. Retrieved November 17, 2015. 1 2 Passan, Jeff (June 14, 2011). "How Jose Bautista went from baseball vagabond to the game's best slugger". thepostgame.com. Retrieved November 17, 2015. ↑ Bradley, Jeff (February 13, 2015). "Jose Bautista giving back to Latin America by giving kids an education". si.com. Retrieved November 17, 2015. ↑ "Trade Central". Baseball America. July 30, 2004. Retrieved September 28, 2011. 1 2 3 Snedden, Jeffrey (July 2013). "The amazing journeys of Chris Davis and Jose Bautista". Pittsburgh Sporting News. Retrieved September 21, 2014. ↑ Kovacevic, Dejan (August 21, 2008). "Pirates trade Bautista to Blue Jays". Pittsburgh Post-Gazette. Retrieved August 21, 2008. ↑ Newman, Mark (July 5, 2009). "Fans face tough Final Vote choices". Retrieved September 21, 2009. ↑ "White Sox acquire Rios from Toronto". ESPN.com. August 10, 2009. Retrieved September 21, 2014. ↑ Stark, Jayson (December 11, 2008). "More free agents coming?". ESPN. Retrieved January 24, 2013. ↑ "Jays re-sign Bautista, McGowan, Chavez, add Gathright". CBC News. The Canadian Press. December 13, 2009. Retrieved July 31, 2010. ↑ "Bautista, Prado named Players of the Week". Major League Baseball. May 17, 2010. Retrieved July 31, 2010. ↑ Zwolinkski, Mark (June 22, 2010). "Bautista's two homers not enough for Jays against Cardinals". Toronto Star. Retrieved July 31, 2010. 1 2 Campbell, Morgan (July 4, 2010). "Blue Jays' Vernon Wells, Jose Bautista and John Buck earn All-Star spots". Toronto Star. Retrieved July 31, 2010. ↑ "Boxscore: NL All-Stars vs AL All-Stars". Major League Baseball. July 13, 2010. Retrieved August 7, 2010. 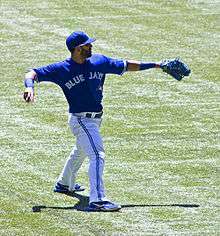 ↑ "Jays' Bautista earns AL monthly award". Toronto Sun. August 4, 2010. Retrieved August 4, 2010. 1 2 Jordan Bastian (August 1, 2010). "Bautista named July Player of the Month". MLB Advanced Media, L.P. Retrieved August 1, 2010. ↑ "Jose Bautista Named Honda Player of the Month". Toronto Blue Jays. MLB. Retrieved September 28, 2011. ↑ "Jay's Bautista shares Player of the Week honour". TSN. August 2, 2010. Retrieved August 4, 2010. ↑ "Peralta, Scherzer Lead Tigers Over Blue Jays". TSN. August 26, 2010. Retrieved August 30, 2010. ↑ "Bautista takes top honours". Sportsnet. August 26, 2010. Retrieved August 30, 2010. 1 2 Molinaro, John (September 2, 2010). "Jays' Bautista wins AL's monthly honour". CBC Sports. Retrieved September 2, 2010. 1 2 "Bautista hits club record 48th homer as Jays thump Red Sox". Tsn.ca. Retrieved September 28, 2011. ↑ "Site Map". Tsn.ca. Retrieved September 28, 2011. 1 2 Bastian, Jordan (September 25, 2010). "Bautista blasts Nos. 51, 52 as Jays drop O's". MLB Advanced Media, L.P. Retrieved September 25, 2010. ↑ "Big lumber nets Bautista, Votto special hardware". Mlb.mlb.com. October 31, 2010. Retrieved September 28, 2011. ↑ "Jays star Bautista wins Silver Slugger award". Tsn.ca. Retrieved September 28, 2011. ↑ "Bautista's big year good for fourth in MVP race". Toronto Blue Jays. MLB. October 31, 2010. Retrieved September 28, 2011. 1 2 3 4 "Jays' Bautista adds to 2010 awards haul | Posted Sports | National Post". nationalpost.com. Retrieved September 28, 2011. ↑ "Blue Jays announce five-year, $64M deal with Bautista". Tsn.ca. February 17, 2011. Retrieved September 28, 2011. ↑ "Jose Bautista named Blue Jays' right fielder". Toronto Blue Jays. MLB. Retrieved September 28, 2011. ↑ "Bautista unanimously wins monthly award". Toronto Blue Jays. MLB. Retrieved September 28, 2011. ↑ "American League monthly honors go to Jered Weaver, Jose Bautista". Toronto Blue Jays. MLB. Retrieved September 29, 2011. ↑ "Bautista belts three homers in matinee win over Twins". Tsn.ca. May 16, 2011. Retrieved September 29, 2011. ↑ May 28, 6:59 pm EDT. "Guillen frustrated as Jays beat White Sox in 14th". Sports.yahoo.com. Retrieved September 29, 2011. ↑ "Blue Jays' Bautista named AL player of the month". Tsn.ca. February 6, 2011. Retrieved September 29, 2011. ↑ Oegema, Cam (June 2, 2011). "Jose Bautista Voted Blue Jay Player of the Month". Bluebird Banter. Retrieved September 29, 2011. ↑ "Jays to move Bautista back to third base". sportsnet.ca. June 23, 2011. Retrieved September 29, 2011. 1 2 "Toronto Blue Jays slugger Jose Bautista tops all to earn starting All-Star nod". Toronto Blue Jays. MLB. Retrieved November 3, 2011. ↑ "Toronto Blue Jays slugger Jose Bautista tops all to earn starting All-Star nod". Toronto Blue Jays. MLB. Retrieved September 29, 2011. ↑ "2011 All-Star Game – Home Run Derby". MLB.com. July 21, 2011. Retrieved July 21, 2012. ↑ 5 hours, 6 minutes ago (April 20, 2011). "Bautista draws 3 more walks in loss to A's". Sports.yahoo.com. Retrieved September 29, 2011. ↑ "Jeter homers, drives in five as Yankees sweep Blue Jays". Tsn.ca. Retrieved September 29, 2011. ↑ "Encarnacion drives in five, Jays comeback to beat Red Sox". Tsn.ca. Retrieved September 29, 2011. ↑ "Yearly league leaders & records for home runs". Baseball-Reference.com. Retrieved January 13, 2016. 1 2 "José Baustista". Baseball-Reference.com. Retrieved January 13, 2015. ↑ "Yearly league leaders & records for bases on balls". Baseball-Reference.com. Retrieved January 13, 2016. ↑ Davidi, Shi (October 24, 2011) Another Aaron for Bautista. sportsnet.ca. ↑ "Top boppers earn Silver Slugger Awards". MLB.com. November 2, 2011. Retrieved November 2, 2011. ↑ "Bautista to grace 'MLB 12 The Show' cover". Sportsnet. January 30, 2012. Retrieved November 17, 2015. ↑ "Rasmus, Bautista rally Blue Jays past Crew". MLB.com. June 20, 2012. Retrieved June 20, 2012. 1 2 Sanchez, Jesse (July 1, 2012). "Rosters unveiled for 83rd All-Star Game". MLB.com. Retrieved July 2, 2012. ↑ "Bautista Named AL Player of the Month". The Province. July 2, 2012. Retrieved July 2, 2012. ↑ "NL, AL Home Run Derby teams unveiled". MLB.com. July 2, 2012. Retrieved July 2, 2012. ↑ "Fielder outslugs Bautista to capture second Home Run Derby crown". SportsIllustrated.CNN.com. AP. July 9, 2012. 1 2 Fitzpatrick, Mike (July 17, 2012). "Blue Jays put Bautista on DL, call up OF Gose". Yahoo! Sports. AP. Retrieved July 18, 2012. ↑ "Jays' Bautista to have wrist surgery; done for season". TSN.ca. August 28, 2012. Retrieved August 28, 2012. ↑ Cormack, Mike (August 28, 2012). "Bautista needs surgery, done for 2012". Sportsnet.ca. Retrieved August 28, 2012. ↑ "Twitter @MLBTheShow". Twitter.com. January 18, 2013. Retrieved January 21, 2013. 1 2 Koreen, Eric (July 6, 2013). "Jose Bautista leads trio of Blue Jays to All-Star Game". National Post. Retrieved January 14, 2016. ↑ Elliot, Bob (July 16, 2013). "Jose Bautista a hit in MLB All-Star Game: Blue Jays slugger sends AL on its way to all-star victory as Rivera goes out in style". Toronto Sun. Retrieved January 14, 2016. ↑ Spector, Jesse (July 31, 2013). "Do deadline deals make sense for non-contenders hoping for quick impact?". Sporting News. Retrieved July 31, 2013. ↑ Casella, Paul (September 4, 2013). "Bautista to miss rest of season with hip injury". MLB.com. Retrieved September 4, 2013. ↑ Kennedy, Brendan (May 11, 2014). "Blue Jays drop third straight to Angels". thestar.com. Retrieved May 12, 2014. ↑ Chisholm, Gregor (June 18, 2014). "Bautista notches 1,000th hit of career in defeat". MLB.com. Retrieved June 18, 2014. ↑ Newman, Mark (June 23, 2014). "Bautista, Tulo named captains for reformatted Derby". MLB.com. Retrieved June 23, 2014. 1 2 Chisholm, Gregor (July 6, 2014). "Mr. Popular: Bautista leads all voters on ballot". MLB.com. Retrieved July 7, 2014. ↑ "Jays beat Tigers in longest game in team history". Sportsnet. August 10, 2014. Retrieved July 1, 2015. ↑ Chisholm, Gregor (August 27, 2014). "Bautista snaps slump by going deep". MLB.com. Retrieved August 28, 2014. ↑ Chidley-Hill, John (August 30, 2014). "Jose Bautista, Drew Hutchison lift Toronto Blue Jays over New York Yankees 2–0". The Hamilton Spectator. Retrieved August 30, 2014. ↑ "Blue Jays hit three homers in win over Yankees". Sportsnet. August 31, 2014. Retrieved August 31, 2014. ↑ "Bautista hits 200th homer as a Blue Jay in rout of Cubs". TSN.ca. September 8, 2014. Retrieved September 8, 2014. ↑ "Allowing Bautista, Encarnacion to acquire veto rights shows the Blue Jays have no desire to trade them". sports.vice.com. June 11, 2015. Retrieved July 1, 2015. ↑ "Encarnacion hits 2 home runs, Blue Jays beat Orioles 13–6". Boston Herald. April 21, 2015. Retrieved April 22, 2015. ↑ Harrison, Doug (June 2, 2015). "Jose Bautista eases back into right field for Blue Jays". cbc.ca. Retrieved June 4, 2015. 1 2 Miller, Doug (July 6, 2015). "Youth served on AL, NL ASG rosters". MLB.com. Retrieved July 6, 2015. ↑ Zwelling, Arden (July 11, 2015). "Bautista to miss All-Star game with sore shoulder". Sportsnet. Retrieved July 11, 2015. ↑ Davidi, Shi (July 22, 2015). "Blue Jays use power to 'force the issue' vs. A's". Sportsnet. Retrieved July 22, 2015. ↑ "Bautista hits 224th career HR in Blue Jays' loss". Sportsnet. July 25, 2015. Retrieved July 25, 2015. ↑ "Blue Jays clinch first AL East title in 22 years". citynews.ca. September 30, 2015. Retrieved October 1, 2015. ↑ "Batting season finder: Spanning multiple seasons or entire careers, from 2010 to 2015, sorted by greatest home runs". Baseball-Reference.com. Retrieved January 18, 2016. ↑ "Batting season finder: Spanning multiple seasons or entire careers, from 2010 to 2015 (requiring at least 3000 plate appearances), sorted by greatest slugging %". Baseball-Reference.com. Retrieved January 18, 2016. ↑ "Batting season finder: Spanning multiple seasons or entire careers, from 2010 to 2015, sorted by greatest bases on balls". Baseball-Reference.com. Retrieved January 18, 2016. ↑ "Batting season finder: Spanning multiple seasons or entire careers, from 2010 to 2015 (requiring at least 3000 plate appearances), sorted by greatest adjusted on-base plus slugging". Baseball-Reference.com. Retrieved January 18, 2016. ↑ "Batting season finder: Spanning multiple seasons or entire careers, from 2010 to 2015 (requiring at least 3000 plate appearances), sorted by greatest adjusted OPS+". Baseball-Reference.com. Retrieved January 18, 2016. ↑ "Batting season finder: Spanning multiple seasons or entire careers, from 2010 to 2015 (requiring at least 3000 plate appearances), sorted by greatest adjusted on-base%". Baseball-Reference.com. Retrieved January 18, 2016. ↑ Chisholm, Gregor (October 14, 2015). "Touch 'em all, Jose: Legacy secured". MLB.com. Retrieved October 15, 2015. 1 2 "Trending: Toronto's love affair with Joey Bats more than skin deep". citynews.ca. October 16, 2015. Retrieved November 17, 2015. ↑ McHenry, Britt (October 20, 2015). "Bautista's bat flip made Joey Bats a polarizing name". ESPN. Retrieved October 23, 2015. ↑ Arthur, Bruce (January 12, 2016). "Alex Anthopoulos has moved on, and so should we". Toronto Star. Retrieved January 14, 2016. 1 2 "Esurance MLB.com awards: Best play, offense". MLB.com. 2015. Retrieved January 6, 2016. ↑ Cassavell, AJ (October 20, 2015). "DYK? Joey Bats' b-day feat among G3 rarities". MLB.com. Retrieved October 20, 2015. ↑ Levinson King, Robin (October 23, 2015). "Fans reeling as Blue Jays eliminated in Game 6 heartbreaker". thestar.com. Retrieved November 17, 2015. ↑ "Blue Jays exercise options on Bautista, Dickey, Encarnacion". Sportsnet. November 3, 2015. Retrieved November 3, 2015. ↑ Chisholm, Gregor (May 15, 2016). "Tension boils over in Blue Jays-Rangers game". MLB. Retrieved May 15, 2016. ↑ Hagen, Paul (May 18, 2016). "Odor, Bautista among 14 disciplined for brawl". MLB.com. Retrieved May 27, 2016. ↑ "Jose Bautista's suspension upheld, will miss opener vs. Red Sox". Sportsnet. May 27, 2016. Retrieved May 27, 2016. ↑ Perry, Dayn. "Jose Bautista does some P.A. announcing while on suspension". CBS Sports. Retrieved May 28, 2016. ↑ "Jose Bautista placed on disabled list after collision with outfield wall". ESPN. Retrieved June 17, 2016. ↑ Chisholm, Gregor (August 2, 2016). "Bautista the newest member of 300-HR club". MLB.com. Retrieved August 3, 2016. ↑ Davidi, Shi (November 7, 2016). "Blue Jays extend qualifying offers to Encarnacion, Bautista". Sportsnet. Retrieved November 7, 2016. ↑ Chisholm, Gregor (November 14, 2016). "Encarnacion, Bautista reject qualifying offers". MLB.com. Retrieved November 14, 2016. ↑ "Bautista expected to miss A's series due to personal matter". Tsn.ca. Retrieved September 28, 2011. ↑ Brunt, Stephen (April 5, 2012). "SN Magazine: Brunt at home with Bautista". Sportsnet. Retrieved December 10, 2015. ↑ Cole, Trevor (June 20, 2013). "Back in the Game: Blue Jays slugger José Bautista's high-stakes mission to stay on top". torontolife.com. Retrieved March 26, 2014. ↑ "Bautista Family Education Fund". bautistafund.org. Retrieved November 17, 2015. 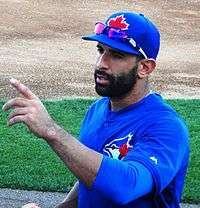 Wikimedia Commons has media related to José Bautista.